Seal Point Siamese cats are the 'original' Meezers, the ones most people (well, most people who aren't owned by one of these fascinating creatures!) imagine when they think of Siamese cats. The ones that are seen in cartoons and films and on TV, and generally give the breed a bad name! So what are they really like? They're real creatures of habit, dislike change, and can be quite possessive - jealous guardians of their owners' affections. They'll quickly let you know - with a piercing glance, a strident 'niaowrr! ', or even a quick rugby-tackle of your ankles - when they disapprove of something you're doing. Seal Points tend to darken with age. This is my boy, Bandit, aged around five. Seal Point Siamese cats have very dark, almost black, seal-brown points, with facial mask, ears, tail, paws, nose leather and paw pads all in the same dark brown color. Of all the point colors, they have the widest variation in body color. When they're young, their coats are generally pale cream, but Seal Points tend to darken with age. Although the fur on their chest, neck and stomach may stay lighter, their backs tend to darken to a cold-toned caramel-beige, and may even turn dark brown, so that in later life there may be little difference in color between the hair on their backs and their tails. Show judges tend to give preference to Seal Points with pale bodies, so it's unusual to see one in a show ring much after the age of two. A Seal Point or a Chocolate? What's the difference? You can find out more about the Chocolate Point Siamese here; there's also a wonderful picture of a Seal Point and a Chocolate Point together on that page that clearly shows the difference. In general, Seal Points are darker all round than Chocolate Points - darker coats, darker points, and with cold-toned rather than warm-toned fur. At a young age it's difficult to tell Seal Point kittens from their Blue counterparts, although both tend to develop their point color more quickly than either Chocolate or Lilac Points. With all Siamese kittens, it can take several weeks for their points to become distinct. 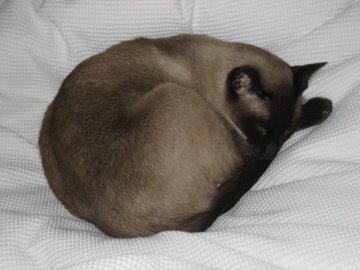 Simon, a Seal or Chocolate Point Siamese? Sharon in Wrexham sent in this lovely picture of her with her Seal Point Siamese, Tia.